People who saw the film have repeatedly spoken to me about Hansruedi Giger’s frailty and his age. Amongst them were a few who were appalled. Of course I gave it some thought during shooting. But my thoughts tended to be about how to arrange a shooting so as to make it comfortable for Hansruedi. And of course, we wanted to maintain dignity at all times. I'm certain that we succeeded. But it's only now that I think I've understood Hansruedi's approach to this. Only now, with some distance to the shoot and after hearing the public's reactions. How provocative! Encore! As a small boy he was already dragging a skull on the string through the lanes of Chur while other children were hugging their teddy bears. He gave his first performance at the age of six, as Till Rippmann of VICE writes (see Press Reviews for an article well worth reading). And then, almost seventy years later, he dares not to withdraw; he speaks in the presence of a camera even though it is no longer easy for him. What provocation in a society that is fraught with and dominated by assertions and norms and obsessed by youth, beauty and fitness. Age and frailty become the greatest taboos. HR Giger always waged war against these taboos, he endlessly drew, painted and sculpted them. It would never have occurred to me during shooting, but Hansruedi Giger’s appearance in this film is again a provocation to some people. Because he simply won't accept being invisible during his latter years, but rather makes himself conspicuous in the eternal cycle of birth, life and death. He becomes a part of his work. His last performance! A little over a week ago I was back at the HR Giger Museum in Greyerz for an interview. Yes, it's true, it's remote. It's a good two-and-a-half hours from Zürich. But it's worth it, the backdrop is fantastic, the Moléson thrones impressively over the whole scene. And if you know that Hansruedi Giger already wanted to be a lord of the manor as a small boy, then it makes sense he set up his museum there in the Château St. Germain. Whenever I'm in Greyerz, I'm accompanied by a conspiracy of ravens. They must have been nesting there for generations already. You cannot fail to see or hear these creatures, ones that are said by specialists to be among the most intelligent of all animals. Last May, when I attended Hansruedi's burial in Greyerz, they seemed to me louder than ever. It was as if they were personally taking leave of the lord of their manor. They circled around the heads of the grieving and croaked to beat the band. No sooner was the coffin in the earth than an incredibly powerful clap of thunder assailed the mournful peace that lay over the cemetery and it began to pour with rain. The ravens seemed satisfied and became silent. I know this sounds like a bad film script. But there are events that you wouldn't dare invent. This is one of them. I've recently been repeatedly asked whether we changed our dramaturgical concept for the film after Hansruedi's death. No, we didn't. But there is at least one scene that we didn't actually want to use but did finally include in the film. Namely the scene where Carmen Giger, the wife of Hansruedi, explains why there's a raven keeping guard over the door leading to Hansruedi's den. Since then, ravens are becoming my favourite animals. There’s something unreal about sitting in a hall with over four hundred people, most of whom you know, and showing a film that till then had only belonged to you and all those who worked along on it. My nervousness was unbounded. I’d have liked to give away my ticket and go home. Luckily I stayed. The kind and appreciative reactions after the screening were overwhelming. And there were many brief encounters among them which moved me greatly, such as the one with an elderly gentleman I had never previously seen, who introduced himself to me with the words “I went to school with Hansruedi,” delivered in an unmistakeable Grisons accent. He thanked me for the film with tears in his eyes. What more could you ask for? The words of thanks I delivered after the screening are dear to my heart. 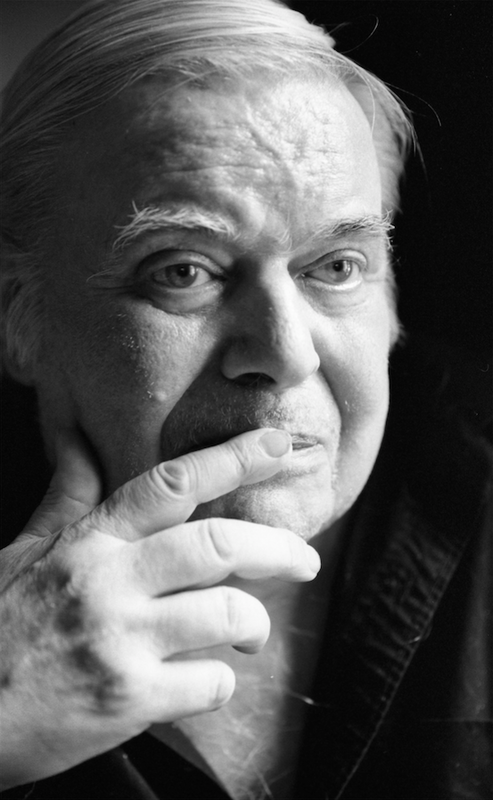 Hansruedi Giger lived 52 whole years in Zurich! Consecutively! Young Giger moved to Zurich from Chur (GR) when he was 22, and never left. He moved to the Oerlikon district of Zurich in 1970, where he lived in the same house for 40 years, until his death. He could’ve lived in Paris, Tokyo, London, New York or Los Angeles, but no. He loved Switzerland, his house in Oerlikon, he loved his family here, his friends, his cats. I don’t think he would have considered moving away, not even in his wildest dreams. It’s no secret that Giger wanted to have a large solo exhibition in Zurich. Except for a small exhibition in the foyer of Kunsthaus Zürich in 1977, it never became a reality. Maybe Giger, with his breaking of taboos, was too provocative for the reserved Zwinglians. Maybe, after winning an Oscar in 1980, he was too famous. Maybe he received too much recognition abroad. For example, in 2004 Hansruedi was awarded “La Médaille de la Ville de Paris,” the Paris medal of honour. Maybe his implementation of Fantastic Realism was simply too hard to categorize. Even today, the Zurich art world is divided over the question of whether Giger is art or not. When I met Hansruedi two and a half years before his death, I had the impression that he was no longer interested in that discussion about his work. I didn’t detect any hint of bitterness when he told me, “They don’t show my work here.” Maybe his composure came from the fact that he knew he didn’t need Zurich to enjoy worldwide success. Who needs an exhibition in Zurich when you’ve already reached countless people all over the world with your art? All that was still going through my head when producer Marcel Hoehn and I considered entering the film into the Zurich Film Festival ZFF. The world premiere, in Zurich of all places? It didn’t take us long to decide. Of course the film must premiere in Zurich! Zurich was Hansruedi’s city, even if he never received medals or support for his work here, not to mention exhibits. Zurich was the city he chose. I don’t think Hansruedi would have wanted to have the film premiere anywhere else. And I am delighted to have the opportunity to release the film at ZFF! At this point I have to add that in recent years Hansruedi no longer liked to travel. For that reason alone, he would’ve been happy not to have to travel for the premiere. Besides, he never liked to leave his cats “Nönneli” and “Müggi I-III” alone. That was true even way back in 1978, when he spent months in the Shepperton Studios in London, working on the film Alien. I was very touched when Hansruedi told me about how he took care of his cats there. But that’s a story for another blog entry. Well, I don’t think that’s the case. Violence from the real world, on the other hand, is definitely a theme in his work. There is violence arising from outer and inner realities, yes, but it’s not the kind that is celebrated or self-perpetuated. While editing the film I sought out the images that fit those stereotypes. I looked for violent images, but also images with the type of sexuality that either excites or disgusts people. And there are several images that are not only powerful, but those that challenge you as well. But they’re not the images people have as part of their fantasies. While doing my research, I found more and more HR Giger images that fascinated me. Every time I looked at his work, with every new insight from the protagonists, I thought: “That’s so powerful! That has to go in the film!” And in the end, I found room for more images in the film than I thought possible. That even managed to spark the curiosity of the woman at the seminar. It’s almost exactly one year ago today that we began shooting the film in Zurich-Oerlikon. In the fall of 2012 we did a quick shoot for a teaser to send along with our different financing applications. 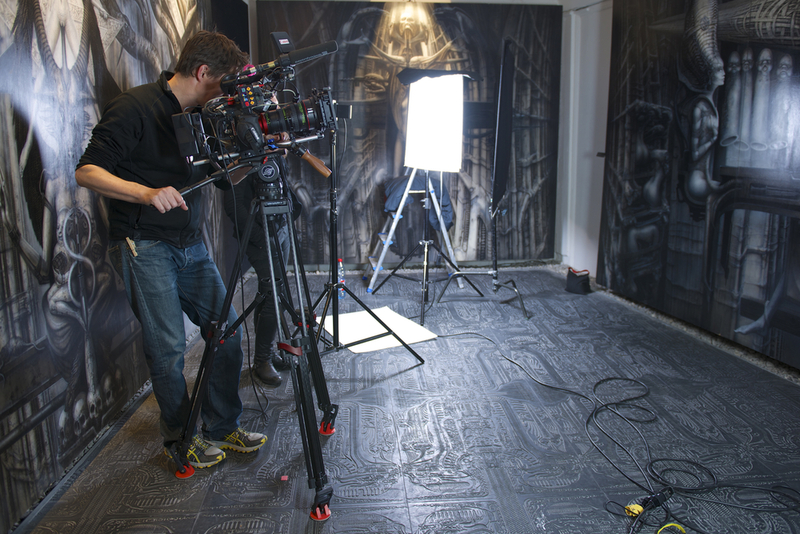 And in June 2013 we did a one-day shoot at the HR Giger Museum as part of its 15th anniversary. But the actual shooting began on 2 September 2013, and that was only due to a certain turn of events. The financing for the film was not concluded yet, but on 4 September Hansruedi travelled to Linz for the Ars Electronica Festival, where he was celebrated as the featured artist, and he had a large exhibition at the Lentos Art Museum. It was a now-or-never situation. After all, I didn’t know if Hansruedi would have many more exhibitions like that. I am very grateful to producer Marcel Hoehn for agreeing to start shooting despite the uncertain financial situation. I can still remember being a little worried when I met Hansruedi on the afternoon of 2 September. I had the impression that his health had deteriorated, that he seemed more tired than the last time I had seen him. I knew right away that I had to rethink my approach. The kind of long and detailed interviews that I like to conduct probably wouldn’t be possible with our protagonist. It was Hansruedi’s humour and self-irony that eased my mind. He simply said, “I never would’ve gotten very far on talking alone.” Anyway, I knew he didn’t like talking about his work at all. Why should I plague him with long interviews? Why should he start giving long speeches all of a sudden? I think Hansruedi was relieved when he realized that I’d distanced myself from the interviews I’d planned and from my usual approach to filming. He repaid me with trust and openness. Although we didn’t carry out any long interviews, we got along quite well. Instead of those interviews, we shot many hours and days (actually usually nights) with Hansruedi and Carmen at the house and in the garden, where they gave us the trust to do our thing. During our short talks we’d inevitably end up laughing – for example when Hansruedi talked about his foreign language skills, or lack thereof. I realized once again how much one can project onto Hansruedi Giger. Marcel Hoehn, the producer of the film, visited us during the final mix. He brought someone along for the screening who told us about the first time as a child he had heard about HR Giger. And it hadn’t been a good experience. His strictly religious parents had told him Giger was a Satanist. That could’ve made for interesting films as well: HR Giger Through the Eyes of His Contemporaries, or The Reception of HR Giger’s Art in the '70s, or The Religious Symbolism of HR Giger, and so on and so forth. There were not only dozens of former companions but also critics that could be interviewed. I could’ve easily found both pro and contra positions. I chose another approach. I wanted to make a personal film. I didn’t want to show what you can already find on the Internet and in countless newspaper articles and TV reports. So I decided on protagonists who had a close relationship with Hansruedi (for the most part anyway), mostly from his family. I wanted to show HR Giger’s world from the inside out, so to speak, and to view him and his surroundings in the most unbiased way possible. Such an approach leaves no room left for accusations, stereotypes or clichés. This might prove disappointing to those with preconceived notions, but that’s a risk I’ll have to take. We’re doing the final mix. Music, sound design, sound editing. Finally, it’s all coming together. I know I've described it already, but I’m going to say it again: You have to hear this film! Admittedly, the attached pictures don’t look all that illustrious, and the people look rather tired. Laura insisted that I add that it’s 2 in the morning! Images don’t become truly three-dimensional until you add the sounds, the atmosphere and undertones of a location. I was reminded of that again today in Peter Bräker’s studio. Even the first time I entered HR Giger’s house (actually three connected houses) I had the feeling that it was alive. It is its own microcosm. Peter is injecting this life to the film by adding the sounds I heard or felt there. Cool. The soundtrack is almost complete. I am once again given new insight into HR Giger’s work. It’s the music of Peter Scherer that shifts my perspective once more, slightly changing my focus from time to time. It’s impressive to hear how masterfully Peter was able to transform the discussions I had with him about HR, his art and surroundings into themes, melodies, rhythms and sounds. People, you have to hear this film! Belinda and I had already been editing for a month when we added new filming dates, as planned, because we needed more footage. This was not only due to HRG’s health, but as Belinda says, because his world has a different rhythm, and there was no speeding it up. It’s not too easy to edit scenes if you never know what’s going to happen next. When we looked over the incredibly diverse material they had shot, the first thing that completely fascinated me was the way HR Giger handled his traumata. I know too well the sometimes terrifying feelings I have when I look inside myself. HRG integrated his traumas into his work. Once he said, ‘First I look at what’s inside me, then I look at what’s around me, what’s in the universe.” I think that’s tremendous. Our greatest challenge was taking HRG’s family, which Belinda saw as an important part of his world, and weaving it together with his own stories and his copious work. We kept trying new structures, which meant new editing sequences. We shifted contents back and forth, trying to create space for an inner matrix to form. Every time we reintroduced something we’d thrown away, we knew that our experiments weren’t in vain, but rather a part of the process. It continues to be a great journey for both of us – a journey into HR Giger’s world. Melancholy got the better of me again today. I was with Peter Scherer, who is composing the music for the film. Right at the beginning of our collaboration I had told Peter that Hansruedi was a huge fan of jazz music. Oscar Peterson, for example, was one of his biggest heroes. Hansruedi had started listening to him way back in his youth in Chur. His affinity to jazz remained, even after working together with a range of musicians from other music genres. That jazz tip I gave Peter Scherer at the time now echoes wonderfully throughout his composition. I became so lost in listening to the music that I thought for a second, ‘Hansruedi is going to love this music,’ only to realize in the same moment that he’ll never hear it. I have no idea why a “World Cat Day” exists, but I just read that it’s today. That makes it the perfect moment to pay tribute to a certain feline: Müggi III. Once someone asked me: What’s the thing that scares you most at HR Giger’s house? I knew the answer right away: Müggi! Müggi is totally unpredictable! When I’m in the same room with Müggi I don’t like to let him out of my sight. It’s not that I don’t like him. On the contrary, I have great respect for him, but he has scared the daylights out of me on several occasions. He delights in sticking his claws into visitor’s thighs, or resting on their shoulders. I’m sure he means well. Maybe it’s just his predatory genes getting the better of him. Maybe he’s just looking for attention (not that I ever had the feeling he needed to look very far) or maybe he’s just showing us who the man of the house is. Whatever the case may be, Hansruedi loved his Müggi III and his predecessors Müggi II and I more than anything else in the world. Several photos testify to this. He often posed with his cats, or had them filmed. Anyone who knew Hansruedi knows that he loved fireworks above all things. Which is why he always looked forward to New Year‘s Eve and the Swiss National Holiday, August 1. Whenever he could, he would fire off a few rockets. Unpublished footage by the late cameraman Stephan Stucki, presumably of August 1998. At last the moving images are receiving the colours that they are supposed to have. Colourist Roger Sommer, (known as Somm) is going about his business in his skilful way. My first meeting with Somm, for the grading of the Teaser in autumn 2012, was surprising to say the least. Hardly had I asked him if he knew anything about HR Giger before he’d shown me his Alien tattoo on his forearm. I was meeting THE very colourist in this world who had a Giger on his skin. You could hardly call it coincidence. There can be no doubt that Somm pulls all the stops of his ability. And anyone who believes the works of HR Giger is merely somber and black is severely deluded. Yes, there are colours in HR Giger’s work! Many of them, and with countless nuances. I became aware of this when I took the time to carefully observe Hansruedi’s work during the course of film research. I soon understood that it's important to carefully film the works, such as those in the HR Giger Museum. Only then could we bring them to the silver screen in the manner that I imagine. I am particularly glad that colour grading was so effective, fulfilling my desire. As Belinda Sallin called and asked me whether I wanted to edit her film on HR Giger, I was both pleased and tentative at once. Since I had planned a studio phase for this period myself, I wanted to be sure that HR Giger was still relevant and worth encountering. Belinda told me about the film she wanted to make and the exhibition in Linz, which was still open for a couple of days. When I saw the pictures by HRG on the Lentos Museum homepage, it was immediately plain to me that he is still relevant and topical, that I wanted to see more of his work and edit this film. It was only one picture, but in that picture alone I saw something other than that which I knew of HRG. It was bright and of a strange, powerful and absolutely idiosyncratic beauty. My curiosity had been awoken. No matter who I talked to about this work, everyone had their own small story about HR Giger. At the same time I sensed a sort of barrier towards his work in almost everyone, a barrier that seems to stand in the way of the work. It was this that we wanted to change. We wanted to make a film showing HRG as a person and as an artist in a radically different way so as to open a vista across his work. We were pursuing this with all our strength when the news of his death befell us. We were shocked. Belinda and I had already been editing the film for months, and during this time HRG had grown much closer to me - as if I had met him many times. Our grief due to his death, and the fact that our most significant viewer, HR Giger, would be missing, paralysed us. And I was tormented by seeing the media reports in which the old and traduced description of his work was repeated again and again. The barriers were manifest once more. But we knew that we were in possession of something else! Editing was definitely coming to an end. Long had Birgit and I suffered, laughed, cried and rejoiced. What a trip! Initially we were delighted by the great material. But since we also wanted to include archive material in our film, we had a huge amount of images. Soon our joy was replaced by concern. How were we to integrate the various temporal and topical matters into a dramaturgical structure? Birgit had the idea of working with screenshots pinned to a whiteboard to keep some kind of overview. It made the editing room look like that of a film- or TV FBI agent - the office of one of those profilers trying to track down a perp. And somehow that was what we were, too. Profilers, attempting to understand the protagonist, his art and his environment. When I heard the news of Hansruedi’s death it was as if we had been paralysed, struck by grief. The first few days we hardly knew how to carry on with our work. We found our way back to our work-rhythm by degrees. Our attitude towards Hansruedi, his work and environment, had never been superficial. We wanted to go into depth, to display a Giger that had never been seen. One beyond all prejudice. We were always delighted when we had the feeling that we had succeeded in this. 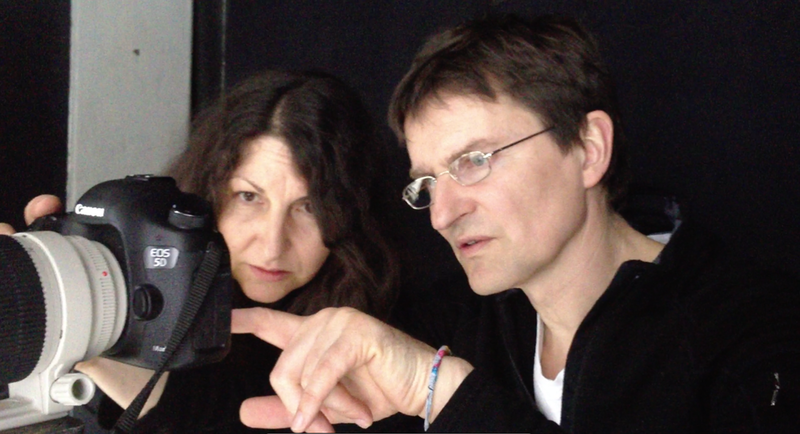 I couldn't have wished for a better editor for this film than Birgit. Being an artist, a painter and photographer herself, she supplied precisely that which this film required. I often had the impression that Birgit’s editing was less a matter of cutting and more one of compiling; that she is not a surgeon, but rather, a weaver. Producer Marcel Hoehn and I discuss the artwork for the film poster with Andreas Peyer. I again examine the photos, the last portraits of Hansruedi. Hannes Schmid made fantastic images. Very close, very direct, very authentic. Yet on that afternoon of May 7 it wasn't plain at all whether Hansruedi would allow himself to be photographed. He wasn't feeling well, was pretty tired. And the lighting was fairly poor, it was raining. And in the kitchen of house number 1, where light generally falls through the thick foliage, the kitchen was devilishly dull. But finally it came about as it often did during shooting. The rain stopped, there was some light in the kitchen, and Hansruedi made himself available for a moment. A brief combing of the hair and then ready for the photo shoot. Then I could lean back and watch how Hannes Schmid, himself a star, one of the great photographers, shot with ease these great pictures of Hansruedi. Hannes took the portraits without any auxiliary means. No lighting, no particular background. Nothing at all. Hansruedi sat there at the kitchen table where he always sat. Using an analogue-camera: Hannes is old school, he had 36 black-and-white shots done within little more than five minutes. The peculiar sound of the camera-ratchet was one that seemed to come from another era. Of it Hannes said, laughingly: "Those were the days: 36 shots and that's your lot." Only we didn't know that Hannes was to prove absolutely correct. He took the last, the 36th picture of Hansruedi. Shortly thereafter Hansruedi retired. He thanked Hannes, and, as always after our shoots, me too. And as always, it being a small ritual between the two of us, I myself answered, "No, thank you, Hansruedi." It was the last time that I saw Hansruedi. It was an appropriate ending to our shoot and – albeit far too early – a good farewell. It is now two months to the day since I got the call from Tom: "I'm calling you as Carmen asked me to", was how he began. I already had misgivings. Carmen and I had established a good relationship during filming. Why should our communication suddenly go via Tom? And even before he had said, "Hansruedi died this afternoon", I already knew it. Yet didn't want to accept it. Everything had been fine. We had finished shooting and were way into the editing. Hansruedi had already been in poor health for some time. It meant that shooting had not been simple for him or us. But we had managed to get this far together, after all. It was a fierce shock. When I met an acquaintance a couple of weeks later who had known nothing about my film project, she claimed I had climbed aboard the bandwagon because of the media hype following Hansruedi’s death. I was perplexed. The film was not created because of such factors. It had been carefully planned long in advance. Hence the idea of this blog. I want to report on the creation of this film together with others. About the filming with Hansruedi, his family and friends, and the work yet to be done in the coming weeks. It remains surreal to me that Hansruedi is no longer with us and at times I simply forget it. While editing, he is a daily presence to me. I'm very grateful for having been able to complete shooting together. We were even able to do the photo shoot for the film poster. Five days before his death. Almost as if he we wanted closure before he left. HR Giger at the garden door. HR Giger next to the bust he had created of his deceased girlfriend Li. HR Giger in front of his work "Friedrich Kuhn II". It shows his friend photographed shortly before his death.